Division 1 – Well done to the lads on a 2-13 to 0-15 win over Aughawillan at the weekend. No Division 1 game this weekend. Leitrim U20 – The Leitrim U20 play Mayo in Castlebar on Saturday with a place in the Connacht Final at stake. Best of luck to all involved. Best of Luck – To all our Club members and supporters as the tackle the State Exams this week. School Boy Success – Congratulations and well done to our schoolboys who won their cup final last Tuesday evening in Páirc Seán beating Aughnasheelin. From start to finish we controlled the game. Aughnasheelin couldn’t get a grip of our running and movement of our players. We had great performances from David Liu Doyle in goals, Luke McManus and George Glaze in defense, Jack Reynolds (C) and Mathew Davis in midfield and Riaghan Ward, Senan Curran, Noah McNulty, Tomás Hynes and John McGoldrick up front. Well done boys. The parents, boys and school would like to thank Jack Reynolds’ grandmother for sponsoring food after the game, thank you Anne. U12 Cross Border League – Our U12s had their first Longford/ Leitrim game last Thursday evening versus Bornacoola in Dromod. The teams were evenly matched, it was end to end from start to finish. This game had everything from great goals, point taking, running, defending, tackling and goalkeeping. After a very exciting game Gortletteragh came out on top. It’s great to see Gortletteragh fielding an all boys team at 13 aside. 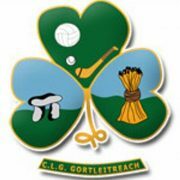 We play Leitrim Gaels this Thursday evening at home at 7:30. Thanks to Bornacoola for refreshments after the game on such a hot evening. U11 – Our U11s travelled to Fenagh for their blitz last Tuesday. . We had a break over the bank holiday weekend. We’ll be back in action next week.